EDIT: As of July 2017, this is obviously no longer the name of this blog. It was being misspelled too often and making the content difficult to find. I want to leave this post up however, as it’s still a concept I absolutely love. Kintsugi (金継ぎ) is a traditional Japanese art form, with the name literally meaning to patch with gold. 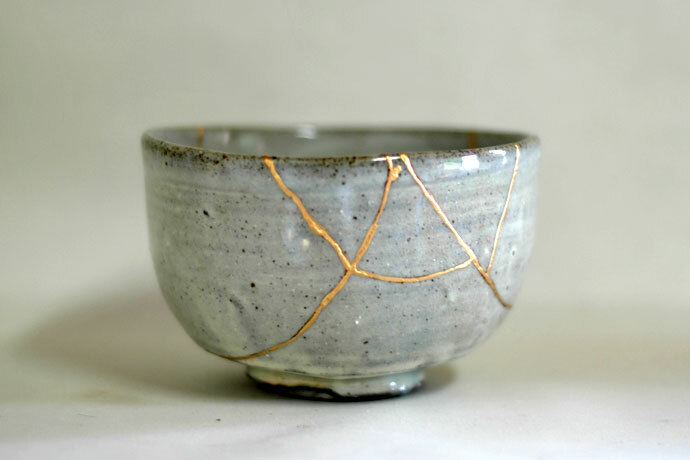 Kintsugi transforms broken pottery into new artwork using gold lacquer to repair the cracks. So why did I choose this name for my blog, given that I’m neither Japanese nor an artist? Being diagnosed with a serious chronic illness and needing an organ transplant are things you never think will happen to you, until they do. When I think about my pre-CKD self, I find her almost unrecognisable. My life has changed forever. I first started blogging in 2006, as a university student, initially I didn’t write about much at all, but once I got sick, it quickly became a vital outlet. However, somewhere in between moving to the UK from New Zealand and becoming increasingly unwell, that blog ran its course and I stopped writing. I couldn’t find the words anymore. Now, facing the prospect of further chemotherapy, impending dialysis and hopefully an eventual kidney transplant, it feels right to start writing again. With a completely new start, although hopefully with some of the same readers! As of October 8th 2016, I now have a kidney transplant! Life has changed yet again. I think it always will! I don’t know what form this new blog will end up taking. There are so many chronic illness and spoonie bloggers out there who are fantastic, inspirational writers with massive followings, not to mention being brilliant sources of information, but I don’t think I’m going to be one of them. I am only myself. If just one person reads this and feels less alone, this blog is worth every word. While I absolutely don’t believe in the concept of “everything happens for a reason”, I do believe that life experiences can be used to give you purpose and direction in life, if you choose to use them that way. I think this blog is a work in progress. It’s evolving from what started out as the ramblings of a young woman trying to get her head around something that had happened to her, and turning into that same woman, now slightly older (and healthier, maybe even wiser), wanting to use these experiences to help other people in similar situations.